Exploration of this color reveals some surprising pigment properties beyond its obvious opacity. 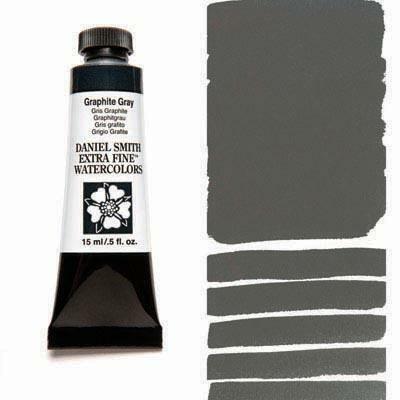 First, Graphite Gray disperses well and quickly in water so floating the dense pigment onto water or into a wet wash offers and interesting handling method. A dry brushstroke quickly followed by a wet brushstroke spreads some of the pigment leaving the texture look of the drybrush. Aged and weathered wood, fence posts and old buildings are fine candidates for this pigment and approach. Try this: overpaint a value sketch with a light glaze. As graphite pencil is entirely acceptable in watercolor, a synthetic graphite pigment, namely Graphite Gray, seems surprisingly natural.